I have read quite a few really good book lately, but today I am going to highlight just two of them. 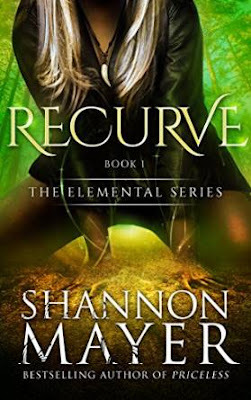 The first one is "Recurve" Book one in the Elemental series by Shannon Mayer. This book is about Larkspur who is an Earth Elemental. Larkspur is witness to a horrible crime as a child, because she witnessed the crime she is in danger. With her abilities blocked Larkspur is essentially worthless to her people. She is cast aside, made fun of and humiliated at every turn. Accused of attacking the queen she is given the choice to face death or join the Enders. This book is full of magic, and action. I loved the fast pace and the characters are wonderfully written. I have bought the second in the series "Break Water"and I am looking forward to finding the time to sit down and read it. I should mention that I read Recurve in one sitting, it was that good. Recurve is an urban fantasy. The ideal reader is adult or young adult who enjoys fantasy. This book was released in March of 2015. This is a spinoff series from Shannon Mayer's Rylee Adamson novels. A Lush reunion is all about second chances in love. This is one of the best second chance love stories I have read to date. Colin and Marsha have been through a lot in their ten years apart. When they both end up living in the same small Texas town they are forced to confront the past and must learn to trust each other in order to have any chance at beginning again. Here is my review of "A Lush Reunion." This book is truly well written, the characters are well developed and personable. Marsha and Colin are very easy to relate to. Colin is the Bass player for the band Lush, he is a recovering addict. Marsha was the love of his life years ago, but something happened (I will not give spoilers) that drove them apart. Now ten years later they find themselves in the same small Texas town. Marsha has a son and her ex is in jail. She never stopped loving Colin and now after all these years she finds herself running in to him all the time. Life is about to get interesting for Marsha and Colin. This is a wonderful love story that tackles some really difficult subjects. Check it out you will not be sorry. I am really looking forward to reading more books by Selena Laurence.